Scroll down the Opportunity detail page to the Products related list and then click the Choose Price Book button. A Choose Price Book page appears. If your company has made only one price book available to you, you can bypass this step and start with Step 2. Select the appropriate price book from the Price Book drop-down list and then click Save. The Opportunity detail page appears again. The Products related list now shows the name of the price book in parentheses. On an opportunity, you can use only one price book at a time. Click the Add Product button on the Products related list. A Product Selection page appears. This shows all the products in your selected price book. If the resulting list of products is too long for your tastes, you may narrow the results by entering a keyword or filter criteria, and then clicking the Search button to begin your search. The page reappears with your search results in a table at the bottom of the page. Select the check boxes next to the products that you want, and then click the Select button. 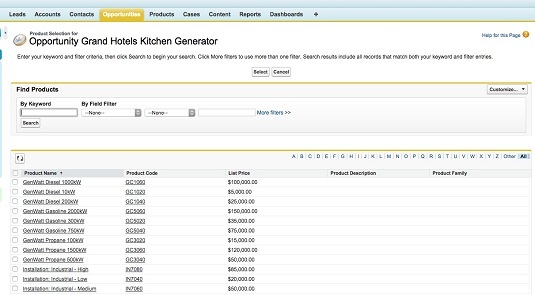 An Add Products page appears with your selections and fields for you to provide line item details. The Sales Price field is prefilled with the default sales price from the price book that you selected. Fill in the line item details. You must, at a minimum, fill in the Quantity and Sales Price fields for each selected product. The Date field is typically used to reflect an expected shipping or delivery date for the product. It could also be used to determine the contracted start date of a service. When you’re done, click the Save button or the Save & More button. Clicking the Save & More button takes you back to the Product Selection page. If you click the Save button, the Opportunity detail page reappears. Notice that the Amount and Quantity fields on the opportunity record have changed based on the total from the products you added. If you need to change the details on your product selections in the course of the sales cycle, you can do this easily on the Products related list of the opportunity record. If you find yourself unable to modify the sales price on your products, you may want to politely confirm the intent with your sales manager. Some companies lock in the sales price for sales reps so that they must adhere to a predefined discount approval policy.